Description / Habitats / Flora / Vertebrates / Insects / Invertebrates / What's that Bug? It would appear that little is known about the spider fauna of Thásos. The sole published record prior to my own surveys seems to be that of Stygopholcus photophilus reported from Drakotrypa cave at Panagia (Deltshev 1985). In a comprehensive monograph on the jumping spiders (Salticidae) of Greece, Metzner (1999) mapped the recorded distribution of all 121 species but was unable to include a single record from Thásos. 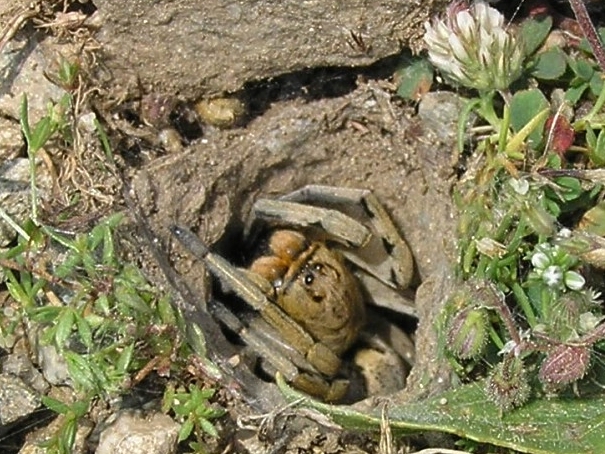 Similarly, Thaler et al (2000) comment on the distribution of seventeen of the forty or so wolf spiders (Lycosidae) reported from Greece, again without records from Thásos. Bristowe's (1935) review of the Greek spiders included records of the 373 taxa reported at the time but it is evident that most studies had concentrated on the Ionian islands and there is a noticeable lack of information from the Aegean. Deltshev (1999) listed 642 species from Greece and a thorough review of available material (Bosmans & Chatzaki 2005) has increased this to 856 confirmed species, but as there are more than 1,400 species known from Italy it seems that there are plenty of discoveries still to be made. 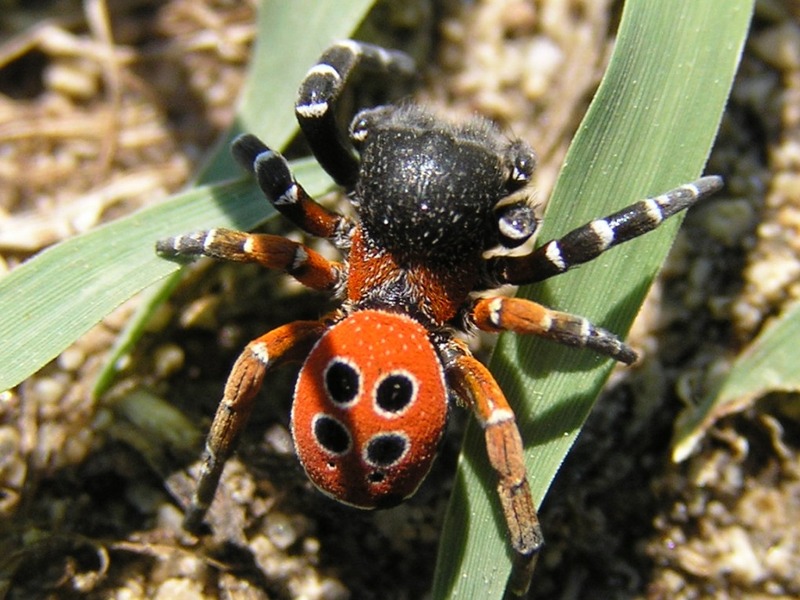 In 2008 a major survey of the spider fauna was carried out in an area of the Nestos Delta on the adjacent mainland (Schröder, Chatzaki & Buchholz 2011), recording 206 species in total. Three conspicuous species that are present on the island deserve mention. The highly attractive red and black males of the jumping spider Philaeus chrysops can be seen in open stony habitats from the coast to the mountain tops, although the less conspicuous female is not so easily seen. It is also unusual to see the tarantula Geolycosa vultuosa above ground, but its turreted burrows are not uncommon in bare friable soils alongside roads and tracks in the middle of the island. This is one of the largest European wolf spiders and its bite is said to be poisonous, although whether this is true is unclear. The beautiful ladybird spider Eresus kollari Rossi 1846 appears to be quite localised on Thásos and I have only found it at Cap Prinos. The exquisite males wander actively across sandy ground in early June but the all-black females rarely stray from their burrows, where they live all year round. In addition to these three I have recorded a further fourteen spider species on the island (Evarcha arcuata, E. jucunda, Heliophanus equester, H. kochi, H. melinus, H. tribulosus, Leptorchestes cf. berolinensis, Marpissa nivoyi, Myrmarachne formicaria, Pellenes moreanus, Salticus zebraneus (Logunov 2009), Saitis tauricus, Synema globosum and Heriaeus hirtus) and I am grateful to Richard Gallon and Dmitri Logunov for the identification of all but the last two of these species (Logunov 2015). 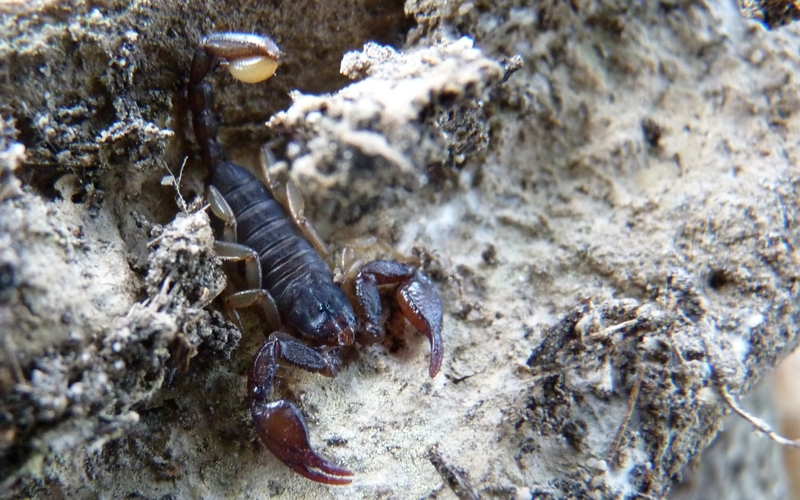 Scorpions are not uncommon under logs and stones in old olive groves and woodland habitats around the lowland fringe of the island and I have also seen them at 850 metres asl on montane scree. The species involved used to be known as Euscorpius carpathicus, and subsequently as E. sicanus, but the taxonomy of Euscorpius in eastern Europe has been the subject of much research (Fet et al 2003, Tropea & Fet 2015). Fet & Braunwalder (2000) reported that four scorpion species had been found in Greece, but Tropea and Fet (2015) state that 21 species of Euscorpius alone are now known from the country, with more awaiting description. Using material collected from Thasos in 1975 (Kritscher 1993), Fet et al (2013) have determined that the widespread scorpion on the island is E. scaber Birula, 1900. Kritscher (1993) found that his scorpions were arboreal on pine trees, sheltering under bark, whilst Fet & Fet (Fet et al 2013) noted that they were also active on the forest floor around Skala Sotiras in 2005, where they hide inside pine cones. At Panagia I have regularly seen them on the ground under fallen bark and branches of the ancient sweet chestnuts. Fet et al (2013) also note that there is another, as yet undescribed, Euscorpius on Thasos. E. scaber is a small, dark brown scorpion, less than 3cm long, and is harmless to Man, like all Euscorpius species. Mesobuthus gibbosus (yellowish with longer, narrower pincers) may also occur on the island and its sting is painful and potentially dangerous to infants. However, Werner (1938) reported that he was unable to find Mesobuthus on any of the Thracian islands (Thásos, Samnothraki, Limnos) and there have been no records since so it is probably genuinely absent. Pseudoscorpions are miniature, only 3millimetres or so long, but fearsome predators of tiny invertebrates. It is claimed that "the Balkan peninsula has the greatest diversity of pseudoscorpions in the world" (Curcic 1986), principally due to the high number of endemics in cave systems along the Adriatic coast. It seems unlikely, however, that the fauna is particularly diverse on Thásos, but two taxa (det. Dr Gerald Legg) appear to be quite common on the island. Dactylochelifer gracilis is widespread in coastal garigue and other shrubby vegetation where it hunts along twigs and branches above ground level, whilst a species of Neobisium (either sylvaticum or hellenum) can be found by sieving grassland litter in lowland meadows. Gruber (1978) reports on harvestman specimens collected by E. Kritscher on Thásos in 1975 and lists Mediostoma stussineri, Phalangium opilio, Zacheus crista and Opilio saxatilis from the island. I have taken a large Trogulus specimen (body length 11mm) from limestone pavement at 850m asl but have not been able to identify this species yet. I have no other information on the harvestmen (Opiliones) or related groups on the island. This inadequate account of the arachnids of Thásos emphasises how much there is still to be learnt about the island's invertebrates. Difficulties in the identification of specimens are no doubt the major reason for the paucity of information but with the appearance of guides such as that by Metzner (1999) there is hope that a greater understanding of the island's arachnid fauna will be possible in the future. There is plenty of scope here to make a significant contribution to knowledge of the island's fauna. Bosmans, R. & Chatzaki, M. 2005. A catalogue of spiders of Greece. A critical review of all spider species cited from Greece with their localities. Newsl. Belg. Arachnol. Soc., 20: 124pp. Bristowe, W.S. 1934. The spiders of Greece and the adjacent islands. Proceedings of the Zoological Society of London, pp: 733-788. Curcic, B.P.M. 1987. On the origin and biogeography of some pseudoscorpions of the Balkan Peninsula. Biologia Gallo-Hellenica, 12: 85-92. Leptonetidae). Acta zooogica bulgarica 27: 41-45. Deltshev, C. 1999. A faunistic and zoogeographical review of the spiders (Araneae) of the Balkan peninsula. Journal of Arachnology, 27: 255-261. Fet, V. & Braunwalder, M.E. 2000. The scorpions (Arachnida: Scorpiones) of the Aegean area: current problems in taxonomy and biogeography. Belgian Journal of Zoology, 130 (Supplement): 17-22. Fet, V. et al. 2003. New molecular and morphological data on the "Euscorpius carpathicus" species complex (Scorpiones: Euscorpiidae) from Italy, Malta and Greece justify the elevation of E.c. sicanus (C.L. Koch, 1837) to the species level. Revue Suisse de Zoologie, 110: 355-379. Gruber, J. 1978. Weberknechte (Opiliones, Arach.) von Inseln der Ägäis. Annalen des Naturhistorischen Museums in Wien. 81: 567–573. Kritscher, E. 1993. Ein Beitrag zur Verbreitung der Skorpione im Östlichen Mittelmeerraum. Annalen des Naturhistorischen Museums in Wien. Serie B. Botanik und Zoologie 94/95, B: 377–391. Logunov, D.V. 2009. New and poorly known species of Salticidae (Araneae) from Turkey and Iran. Contrib. Nat. Hist. 12: 899–919. Metzner, H. 1999. Die Springspinnen (Araneae, Salticidae) Griechenlands. Andrias, 14: 3-279. Schröder, M., Chatzaki, M. & Buchholz, S. 2011. The spider fauna of the Aladjagiola wetland complex (Nestos Delta, north-east Greece): a reflection of a unique zoogeographical transition zone in Europe. Biological Journal of the Linnean Society, 102: 217–233. Thaler, K., Buchar, J. & Knoflach, B. 2000. Notes on wolf spiders from Greece (Araneae, Lycosidae). Linzer Biologische Beitraege, 32: 1071-1091. Tropea, G. & Fet, V. 2015. Two new Euscorpius species from central-western Greece (Scorpiones: Euscorpiidae). Euscorpius— Occasional Publications in Scorpiology, 199: 1-16. Tropea G. & Rossi A. (2011–2012) A new species of Euscorpius Thorell, 1876 from Corfu, with notes on the subgenus Euscorpius in Greece (Scorpiones: Euscorpiidae). Onychium 9: 27–37. Werner, F. 1938. Ergebnisse der achten zoologischen Forschungsreise nach Griechenland. SB. Akad. Wiss Wien, Mathen-naturw. Kl.,147: 151-173.